Mobile World Congress 2019 is currently in full swing, and aside from all the ambitious, weird, and sophisticated new handsets on display at the show, without a doubt the other big topic for the show is 5G. But before anyone goes on a 5G tech spending spree this year, there are three big things that have me feeling bearish on 5G between now and 2020. Despite being announced back in August 2018, there’s still no official info on when the 5G Moto Mod will be available. In the UK, hopefully things should be a little better – but unless you live in a major city, you'll still have to wait a while. EE will be turning on 5G in London, Cardiff, Edinburgh, Belfast, Birmingham and Manchester by the middle of 2019, and another 10 cities will join that lineup by the end of the year. Other networks shouldn't be too far behind. Vodafone plans to have 1,000 5G sites active by 2020, and Three plans to launch its 5G network at some point in 2019, too. O2, on the other hand, has already said that it won't be launching its 5G commercially before 2020. Realistically, smaller townships, suburbs and more rural areas will likely be waiting a couple more years until 5G is reliably available. Perhaps longer, since some areas are still waiting for reliable 4G. Alternatively, if you’re thinking about buying a more “traditional” 5G-ready phone that doesn’t need separate attachments, consider this: Back in December, OnePlus founder Carl Pei said that he expects the company’s upcoming 5G phone to command a £200+ premium over a normal 4G phone. That’s a lot of extra dough to spend on a phone for somewhat nebulous benefits. How much are you willing to pay to see a 5G icon in your phone’s notifications bar? Meanwhile, even though Samsung listed prices for the new Galaxy S10 range, and the painfully expensive Galaxy Fold, Samsung did not provide pricing for the Galaxy S10 5G. But if we do some rough math and use the S10+ price tag as a starting point, and then factor in the S10 5G’s giant 6.7-inch screen, its two depth-of-flight cameras, and its all-important 5G modem and antennas, we’re looking at a phone that could easily cost £1,500 or more. It’s a sort of similar situation for LG’s V50 5G because even though it was announced, neither LG nor Sprint (the V50's first 5G carrier) has announced pricing for the phone. Additionally, it seems like phone makers know these phones will be hard to move based purely on the inclusion of 5G, so both LG and Samsung added things to their 5G phones like depth-sensing cameras or a dual-screen accessory to help increase their value. 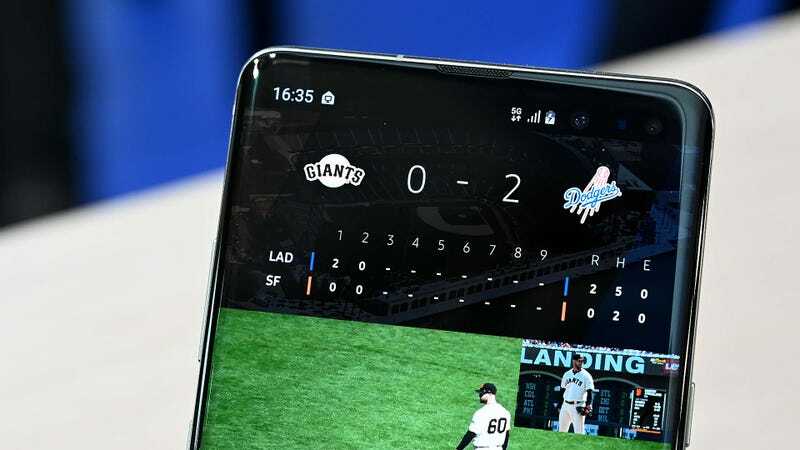 Samsung’s 5G MLB demo app was cool, but not something that can be replicated at scale yet. Now all this doesn’t mean I’m down on 5G, as the tech has tons of future potential. Testing out new tech is fun, and being an early adopter gives you first-hand experience observing how new platforms ecosystems develop over time. But for 2019, it’s important to realise what mobile 5G really is: a glorified beta test. At best, it’s like pre-ordering something or funding a Kickstarter, both of which are moves fueled more by hopes and dreams than anything based in reality. So if you’re someone with spare cash lying around, and you are curious about 5G – or are the kind of person who likes posting “First” in YouTube videos – go ahead, dive into 5G. But for everyone else, you’ll save a bunch of money by waiting, and with 5G adoption rates for phones only expected to hit 0.4 percent in 2019, you won’t miss out on much either.